Our body’s immune system is a natural defense mechanism essential to survival. With such a significant role in health, the immune system is a common target of influence for integrative practitioners. However, many clinicians lose perspective of this important system with all of the nomenclature unique to this system. What follows is a clinician-oriented overview of natural killer (NK) cells and macrophages, two important components of the immune system. Macrophages are a part of the myeloid linage of cells. They differentiate from monocytes in the blood and travel to tissue where they become macrophages. 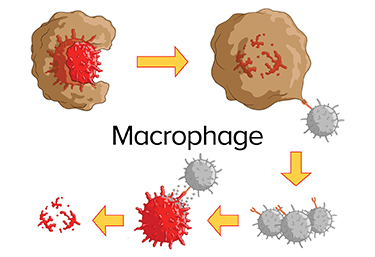 Macrophages are large, irregularly shaped cells with a large cytoplasm and numerous vacuoles.1 Macrophages provide a first line of defense in the innate immune response to pathogens. They have the unique ability to engulf material (phagocytosis) and eliminate debris. In addition, they release biologically active proteins called cytokines and recruit other immune system cells to stop the infection from spreading.1 Macrophages have several different receptors on their surface that help them effectively identify and bind pathogens to promote phagocytosis and stimulate the release of cytokines. The receptors include: IL-1, IL-6, CXCL8, IL-12, and TNF-α. The inflammatory cytokines released by the macrophages have the ability to stimulate effects at the site of the infection (local) and throughout the body (systemic). Examples of the effects of inflammatory cytokines include the recruitment of neutrophils to the side of infection by CXCL8 and activation of NK cells by IL-12. Lauren Martin is a Certified Nutrition Specialist practitioner who earned a Master of Science in Human Nutrition from Columbia University. She co-founded Martin Family Style, a lifestyle, food and nutrition blog. Lauren is the lead author of the blog's nutrition section. She earned her Bachelor of Science in Nutrition from Oklahoma State University. 3. Moretta L, Pietra G, Vacca P, et al. Human NK cells: From surface receptors to clinical applications. Immunology Letters. 2016;178:15-9.